← Drunk? Daniel Radcliffe Should Be Stoned! The Muppets hit their peak in the 1970’s with the original Muppet Show TV series. This was followed by several movies. Some were original Muppet stories, others adaptations of literary works with The Muppets playing characters. The Muppet Christmas Carol in 1992 was probably their cinematic peak, and it has gone downhill from there. The Muppets have never gone away, with a TV show, Muppets Tonight, in the late nineties, and several TV specials and direct to video/DVD releases. They have, up ’til now however, failed to recapture their glory days. Their new movie, The Muppets, was their big shot at trying to rise back to the top of the industry. With a US domestic gross of around $87m against a budget of $45m, they have doubled their money already. With a massive 97% fresh rating on Rottentomatoes.com, it has also been a huge critical success. All this proves, however, is that with a big star leading them onscreen, a talented comedy writing team off-screen, and a big marketing push, they can make a reasonably successful movie. Whether or not they have made a new generation of fans, however, is so far unclear. The young fans from the seventies are now at an age where they have their own young children, and have enjoyed introducing their offspring to one of their childhood loves. This one movie will not be enough to keep the attention of the ADD generation, though, and whoever is managing the Muppet brand needs to move fast to keep their image visible. What are their options? The obvious choice, and a strong possibility considering the success The Muppets has enjoyed. It would take a long time to put together, of course, and the storyline could be a problem. The Muppets was a return to the roots of The Muppet Show, and the first Muppet Movie. Where to go from there from a storyline perspective is tricky. Is there a place for a sequel where Jason Segel returns? The Muppets has a definite conclusion, so would a sequel then need to be completely unconnected? The difficulties of following up an initial great Muppet movie are what led to diminishing cinematic returns the last time around. The Muppets were cinematically reinvented with The Muppet Christmas Carol. It was emotionally satisfying, with great songs and the obvious festive appeal. Again, however, the follow-up was not so impressive. Muppet Treasure Island was an attempt at recapturing the same magic, but did not have the benefit of the same simplicity of story. It was The Muppet Wizard of Oz, another literary adaptation, which finished off the Muppet movies in 2005. It will be difficult to find a property that suits The Muppets, and another misstep could be fatal. 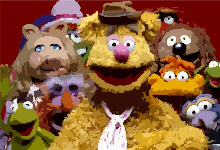 There was a series of Muppet merchandise that involved them recreating scenes from famous and popular movies, and Muppets from Space featured parody of several properties. Would a Muppet parody of a classic film or genre be fresh and new enough to delight audiences? The Scary/Disaster/Superhero/Date Movie abominations being churned out on a regular basis have given parody a terrible name, and it would probably not be advisable for them to associate themselves in any way with such bad material. The time for Muppet: Impossible has unfortunately passed – they could have done with going this route direct from Muppets in Space. The Muppets have always worked best with a celebrity or two in their midst, and a new TV show that featured as many celebrities as Muppets could do well. A David Letterman-style talk show could work. It would obviously have to be pre-recorded, but could go out early evening as a ‘live’ chat show, with several celebrity guests. The backstage vignettes could still be used, interspersed with genuine interviews, with Kermit front of house, backed up by Fozzy and The Electric Mayhem providing music. In order for the guests to remain topical, promoting their latest movies etc.., it would involve a hectic filming schedule, and would probably have to be kept to once a week. There are other directions they could be taken, of course. It may well be that there are no plans to further the brand. The Muppets have been bubbling under the surface constantly over the last thirty years. Always there with a movie, a TV special, or doing a commercial. Merchandise is constantly sold, and they remain in on the edges of the public consciousness. It may be that this is enough, that there is no desire to try and have The Muppets take over the world. For me, though, such enduring characters deserve to be given a real go at a major comeback. Whatever happens to them, they’ll always be in my memories. It would be nice, though, if they could live on in the memories of our children too. This entry was posted in Articles, News and tagged box office, critical, jason segel, kermit, muppet show, news, sequel, success, the muppets, tv. Bookmark the permalink.